Erdogan flexs his muscles and hundreds of cops attack left-wing districts. „After the antiterrorist squad broke through the roof and the window, they started firing pepper-balls and gas grenades, then stormed the house and destroyed everything in their path. They burned our laptops, vandalized our rooms and they even broke our pet bird’s neck. Afterwards they took us to the police station and continued hitting and abusing us,“ Mustafa*, one of the youths from the left-wing Alevi district of Okmeydani, Istanbul, tells me. Another youth shows me his head injury caused by a teargas grenade. 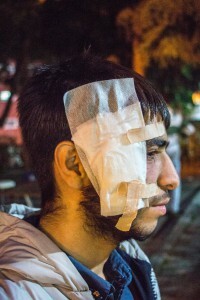 Quite a common injury in Turkey, since the police not only use teargas for its original purpose, but also use the grenades as live ammunition by aiming straight at people instead of firing it in the air at an angle. During last June’s Gezi resistance, this resulted in several deaths. 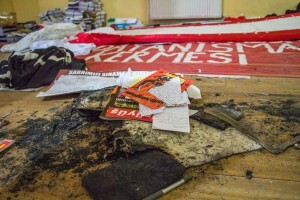 We inspected the office of the Anatolian Youth Federation. 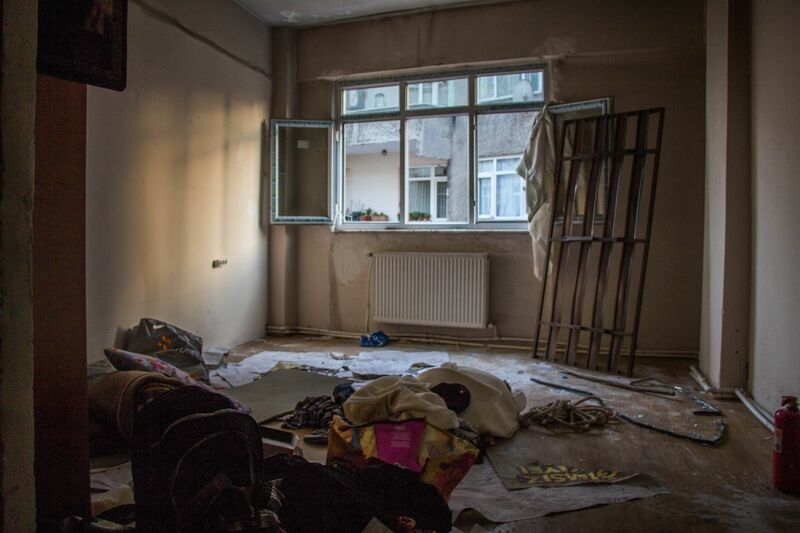 The aftermath of the brutal police attack was still visible – smashed windows, broken metal bars, burn marks. Last Monday’s police raid targeted districts where resistance is the norm: Okmeydani and Gazi Mahalessi, Yenibosna, Kücük Armutlu, and Alibeiköy. In the weeks following the massacre of Soma there has been a rise in violent clashes with the police. Two people died during recent protests in Okmeydani. Ugur Kurt was shot in the head by a policemen with live ammunition during a memorial service at the Alevi cemevi, and Ayhan Yilmaz died after a stun grenade exploded right next to his head. Offices and private apartments were raided and searched. 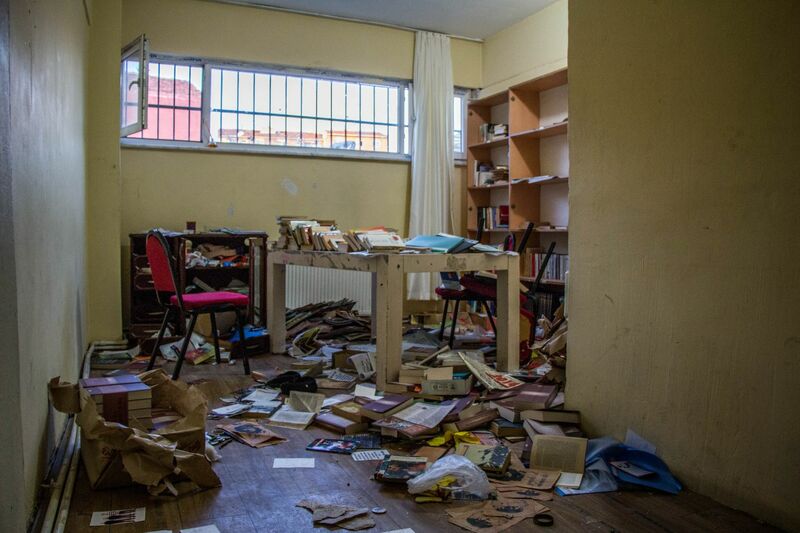 The largest and longest search took place in the headquarters of the Anatolian Youth Federation, a five-story building which is actually well protected against the unwanted guests. And there are plenty of those. During a previous raid the cops ripped a huge hole in one of the outside walls, since they couldn’t breach the well-secured entrance. The antiterrorist squad couldn’t breach the door this time either. They gained entrance over the roof and through a window and „searched“ the building. We were shown the chaos left in the wake of the search. It looked like the aftermath of a frenzied rampage of a horde bent on devastating the whole building, rather than a police search of premises. Closets were hacked to pieces with axes, walls destroyed, windows smashed and fires had even been set. Monday’s attack resulted in dozens of arrests. Erdogan appears to be making good on his vows to „clean up“ the opposition. Having gained a lot of popularity after last year’s Gezi uprising, the radical left-wing movement in particular feels the full brunt of this crackdown. And so they in turn armed themselves and masked and armed militia marched through in Okmeydani and Gazi Mahalessi to protect their neighborhoods.